In 2006, Guyana's President Bharrat Jagdeo outlined an offer to place almost the entirety of Guyana's rainforest under international supervision as part of the world's battle against climate change. In the Green Room this week, President Jagdeo sets out his views on how to reduce the 18% of greenhouse gas emissions caused by tropical deforestation. Currently, rainforests are worth more dead than alive"Imagine a business which invested 80% of its profits in products with the lowest rate of return. Is this business destined to succeed? Unlikely. Yet global efforts to combat climate change bear a worrying similarity. The Kyoto Protocol has resulted in the emergence of a more than US$60bn (£34bn) carbon market as the world's main mechanism to reduce greenhouse gas emissions. This is a welcome start. But about 80% of this money goes to countries which cause less than 20% of emissions. We will fail future generations unless we address this lack of proportionality. In early December, we will have a chance to do this when representatives of almost 200 countries gather in Poznan, Poland to continue forging an agreement to succeed the Kyoto Protocol. As a rainforest country, securing a proportionate response to tropical deforestation is of particular importance to Guyana. 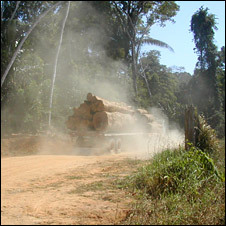 Tropical deforestation contributes about 18% of global greenhouse gas emissions. That is about the same as the total emissions from the US, and more than the entire global transportation sector. Yet under the Kyoto Protocol, it remains more valuable to cut forests down than to leave them standing. "Protecting rainforests is not only an environmental concern but an economic issue that cuts to the core of a nation's development"
- Can capitalism save the Amazon? If we are to solve this problem, we need to first accept a fundamental point. Legal deforestation takes place because forest communities and countries can earn money and create jobs by selling trees and clearing land for agriculture. These are legitimate objectives for citizens and governments to pursue - particularly because most rainforest countries are among the poorest in the world. By contrast, the global economy does not value the services that forests provide when trees are kept alive, including the avoidance of greenhouse gas emissions. Correcting this market failure will require recognising that protecting rainforests is not only an environmental concern but an economic issue that cuts to the core of a nation's development. It therefore needs sustained attention from the highest levels of governments. I was my country's minister of finance when the Kyoto Protocol was agreed, and I paid very little attention to it. This was a mistake; and I advise today's ministers of finance, prime ministers and presidents to ensure that they give climate change and deforestation a greater priority than I did. As well as national leadership, we need international partnership. No country can go it alone. We need the active involvement of governments, businesses, non-governmental organisations and conscientious people everywhere, to advocate for action and to devise realistic solutions. In Guyana, we are ready to play our part, and to provide a model for other rainforest countries to share. Our deforestation rate is one of the lowest in the world and we want it to stay that way. However, we also face considerable development challenges. We need better schools and hospitals, more jobs and economic opportunities, and to meet all the other economic and social demands of Guyana's people. I frequently receive proposals from investors to convert our forest into land for agriculture or biofuels. Agreeing to these would be a quick way to meet the development challenges we face. But in Guyana, we are acutely conscious of climate change. Most of our population and productive land are below sea level and suffering from changing weather patterns. In 2005, floods caused economic damage equivalent to 60% of our GDP. We recognise that as a nation where over 80% of our surface area is tropical rainforest, we have an obligation to our own people and the wider world to seek to preserve it. The conservancy east of Georgetown supplies water for irrigationThis is why in 2006, I suggested that the UK and Guyana could work together to identify bold rainforest solutions that could be used as models for the world. For our part, we are willing to place almost our entire rainforest - which is larger than England - under internationally verified supervision if the right economic incentives are created. This does not mean sacrificing sovereignty over our forest or restricting the development aspirations of our people. It simply means allowing globally recognised supervision to verify that activities within the forest are sustainable. At the UN climate meeting in Poznan, I will be outlining our vision in greater detail, and I hope that many British people will support our efforts. This hope stems from my experience at the 1998 meeting of the G8 in Birmingham, when I joined British NGOs to lobby for debt relief. Thanks to the efforts of these NGOs and thousands of individuals from across the UK, the British government took the global lead on securing debt relief for countries such as mine. This has transformed the lives and livelihoods of millions. With climate change and deforestation, the prize is greater still. I hope that the months and years ahead will see us renew our partnership. And I believe that this can be our contribution to winning the battle against our generation's defining challenge." Note GSI: Below follow some of the comments made on the BBC News website. For the most recent comments, or to leave your own comment, please proceed to the original article on the BBC Website. Do you agree with President Jagdeo? Does forest protection need a higher priority in moves to curb climate change? Should western governments reward poorer countries for preserving their forests? Does this compromise their sovereignty? Or are poorer nations just trying to get cash for "business as usual"? I believe that protecting the rainforest is a good idea; one has to see the forest as not only reducing the greenhouse effect but also as a home for wildlife and the indigenous people. The Western governments play a great role in the climate changing that we are having now. Why not let them help in saving the future generation. Why not spend British money on British projects to restore rainforests in the British Isles? There used to be an great Atlantic rainforest stretching from Ireland to Scotland. There are still some remnants, there is room for trees and mostly, there are people willing to plants trees. While I agree with Mr. Jagdeo's proposal as a long term strategy, I think in the short-term both Guyana and the international community need to focus on the current destruction to Guyana's forest by multinationals such as Barama (Chinese company). A lot has been written on this before but little action seems to have been taken. In addition, many mining operations are also guilty of destroying pristine forestry resources as well poluting waterways. The Omai spill was a classic example of the destruction and cover-ups. It is important to save & preserve the rain forest before it is lost forever to logging.However there are plenty of Indiscriminate logging by foreign companies in Guyana,such as BARAMA.The government should pay more attention as to what is going on with BARAMA & the rainforest. I'd like to understand more about how to structure economic incentives to help countries with rain forests. What, specifically, is the appropriate source of funding to preserve these vital resources? How should we decide who should pay these countries and how much? Since we're all fond of breathing, don't all humans owe some debt to the guardians of the planet's rain forests? And how do we best penalize those responsible for polluting the planet while simultaneously getting funds to countries to preserve the planet's "lungs" ? Has anyone read anything useful on the economics of this? It has long been known that the Rain Forests are the lungs of the world, instead of cutting all these trees down, and causing massive soil erosion, changing the wind patterns etc, we should spend tne needed ammount of money to rebuild these forests and start letting the trees themselves clear the CO2 from the air. Come on world, get planting. President Bharrat Jagdeo has come up with a splendidly straightforward idea. If the income from Guyanese forest is to be foregone for the sake of the rest of the world then that country should be recompensed so that it can build and maintain its hospitals and roads etc. Say that is worth $US12/ acre/year of Forest in royalties foregone then it is a simple exercise to work out what is to be saved according to the total amount of recompense offered. However, it is not a one way deal. The Forests saved from harvesting must be maintained in a secure way against the many pressures organised and disorganised, legal and illegal that would destroy them. For that you might add another $US12/acre/yr. Is the President able to make a binding contract to protect the Forests, I wonder? Probably the easiest thing to do is monitor the result. Even the man in the street can see what the satellites take pictures of these days. Demand for wood from Asia will push up the value of timber in these Forests. A long sighted investor in keeping the Guyanese Forests might consider a deal now is sensible when commodity prices must inevitable rise with the global population growth. The protection of the world's rainforest is key as we go forward in the future. Mr. Jagdeo outlined some key points which needs to be taken into consideration and applied. Of course we should change the way we hold and maintain our forests. Trees are the reason homo sapiens sapiens evolved into modern humans, they shelter all living things, and they literally blanket the planet in a healing, renewing, and protective canopy, giving the earth healthy lungs. It will be one of the major accomplishments of the human species to not only halt the destruction of our beautiful and vital forests, but to restore, renew, and cultivate them. In so doing, we will change our worldview into one that has a deep and abiding respect for all life, and especially the trees. It's a great comfort to read Mr. Jagdeo's words here. If other presidents or PMs of countries which contain rainforest would face the issue like he has done, we could see some real progress toward eliminating deforestation and reducing carbon emissions. An unfortunate reality is that, if these other countries don't get on board with this plan, saving only Guyana's rainforests probably won't do much to address the larger issues and prevent potentially catastrophic climate change. Preserving rain forests is obviously a good thing, they are a part of the planet's natural heritage and are of unparalleled beauty. It's just a shame that they have to be saved in the name of the rather sinister scam known as 'climate change' (formerly referred to as 'global warming' until it became impossible to maintain the preposterous lie that the planet was getting warmer). To believe that human CO2 emissions are radically changing the climate of the planet is not only ridiculous and arrogant, but also plays into the hands of the elite, who are all too willing to impose a new global form of global taxation. It's easy for us to say "of course we should save the rainforest!" since none of us live there. The point of the President's speech is that we urgently need to find ways of sustainable opportunity and development for people who live in those areas so that they won't be tempted to sell off their forests for lumber or farm land. I do not believe carbon dioxide is a problem - it is not toxic and it does not cause appreciable warming. In fact the contention that co2 is the cause of our problems is not yet settled - it is only models that tell us so - which to date have a lousy prediction record. But we must still protect these forests because of the biodiversity that will be lost if we do not protect them. We must address the economic factors (food) causing deforestation. These means more efficient and productive methods and technology to create higher output per acre. WOW! Is President Jagdeo one of kind? Putting people before profit is a rarity. Population control and deforestation need to be at the top of everybody's agenda. It is perhaps needless to say that Mr Jagdeo has acted far more wisely compared to the majority of the politicians in the world. His vision is certainly a most welcome one and one that makes us rediscover faith in the statesmen of the international society. However, I am pretty sceptical if his lead will be followed by others across the globe. The power is still with the people who would rather destroy the rainforests for quick profits rather than preserving them for long term benefit. Let us see if the UK and the Guyana governments can set an example for the rest of the world to emulate. Is it the begin of a new colonial era? Is Guyana's President Bharrat Jagdeo giving away Guyana's children future land to "help" fight climate change? Are the poor countries first on the line to pay for rich countries emissions? First fight the climate change, then loggers, drug dealers, a leftlist president, etc. President Bharat Jagdeo seems to have forgotten what colonialism was about. Rich country's seems always willing to "help" or "free" countries with rich natural resources. Terrible to see that even a BBC documentary is part of this PR initiative, that is selling a "green colonialism". I have 18 trees in my yard; Can I get paid to not cut them down? Preserving the rain forest is vital, but this sounds more like a scheme to line one south American politician's pockets. Fantastic idea we use the money we are spending on reducing emission to helping keep a forest alive. Which gets rid of emission the proper way? I believe that we should keep as much of the rainforest as possible.....Urban development is creating its own problems with more and more flooding of major towns and cities. The BBC's programme lost land of the Jaguar should be more than enough proof that we still have parts of this world left to investigate and wildlife to find and protect. Pay the relevant countries to protect our world by stopping logging and preserving the rainforest, so that our future generations can have a world worth living in. I hope to believe there will be as much action and encouragement in this regard between both parties. Certainly the priority needs to be escalated far quicker than it has been.